David Clifford in action against Galway in the league game in Tralee earlier this year. THE full All-Ireland senior football championship Super 8 fixtures for next weekend were confirmed on Monday afternoon and tickets are now on sale. As we all knew, Kerry play Galway in Croke Park at 4pm, a game that clashes with the World Cup Final which kicks off at the same time. RTE 1 will have full coverage of the Kerry and Galway match but Sky Sports will be showing the ‘curtain-raiser’ at 2pm when Kerry’s Super 8 group opponents Kildare clash with Monaghan. 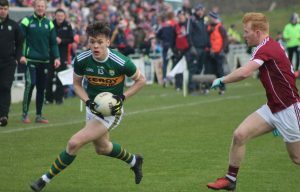 Meanwhile, the Kerry Under 20s will play their All-Ireland semi-final against Kildare at the Gaelic Grounds in Limerick on Saturday at 4pm. It will be preceded by the All Ireland U21 B Hurling clash Kerry vs Kildare at 2pm.